Have you ever tried to shave in the cold, or using cold water? If so, you know that it won’t get you the best results. To get a nice, clean shave, your skin must be warm. Warmth opens the pores and primes your skin. A lot of times, it can be hard to get your skin to the right temperature. Even if you’ve just stepped out of a hot shower, the application of cool (or cold) shaving cream can tighten your pores and affect the quality of your shave. Since you may not know what to look for in a shaving cream warmer or which brand to buy, we’ve put together this buying guide to help you. Let’s start by figuring out what features to look for to buy the best one. The downsides to this machine are its size, which is on the large side, and the fact that it uses special soap. It’s not ideal if your preference is to continue using your current setup. The price is on the high side, too, as you might expect for a professional product. However, if you’re willing to spend the money, this is a great product that delivers excellent results and a smooth shave. This model also comes with a brush for easy cleaning. One thing you may not like about it is that it works only with shaving cream concentrate, which means you’ll have to switch from your current shaving soap. There are less expensive machines available, but if you want a high-quality machine that’s good enough for professional barbers, this is an excellent choice. You’ll be sure to get a great shave every time. Our next review is another professional machine that is suitable for home use as well. 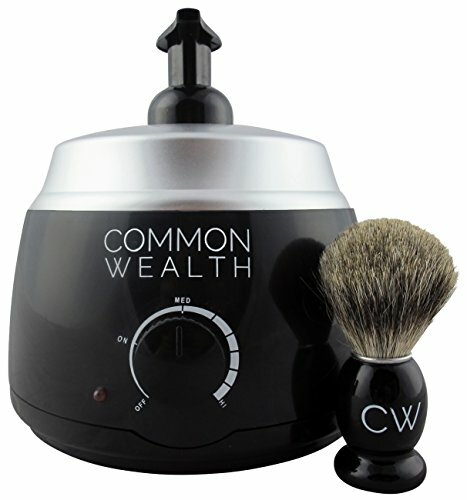 This machine is sold as a kit together with a shaving brush and eight ounces of concentrate. That makes it a nice gift if you want to buy one for a family member or friend. We also like that this comes with a one-year warranty. Its price is significantly lower than some of the other items we’ve reviewed, so it’s ideal for people who want a professional shave at home. What we don’t like is that this machine takes a full 30 minutes to heat up. If you want to be able to shave at a specific time, you’ll need to plan accordingly and make sure to turn it on ahead of time. There are also some issues with the included instructions. We found that the ratio of water to gel concentrate specified was a little low. Adding twice as much concentrate produces a rich and creamy. This machine is also a little on the large side, so it may not be ideal for people who have limited counter space. You’ll need to decide whether you have room for it in your bathroom. The next product we want to tell you about is from Conair, a well-known name in home grooming appliances. It’s the Conair HGL1NR Dispenser. This machine is slightly less expensive than the professional models, but we love its compact size and the fact that you won’t have to give up your favorite shaving gel to use it. On the downside, the Conair HGL1R machine does not work with shaving gels. If you’re accustomed to using a gel, you’ll need to switch to cream. 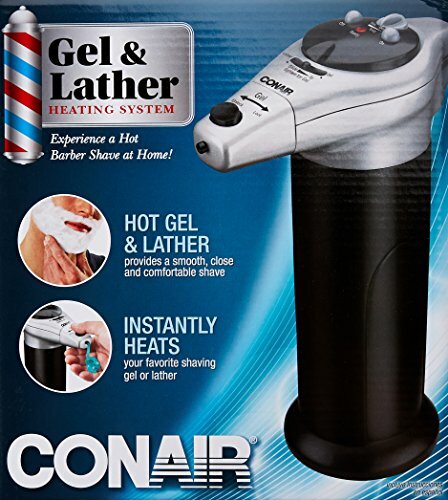 That said, Conair HGL1R is reliable, compact, and it does a great job of delivering hot lather whenever you need it. We recommend it for anyone who wants a warmer but has limited counter space. Our next review is the LatherKing Next Generation, another product that is designed for professional use but is suitable for home use, as well. There are a few things we think could be better. The first is that it takes a full 30 minutes for it to heat up, making this machine less than ideal if you’re in a hurry. It’s also the largest model we’ve reviewed (10.5” by 7.5” by 7.5”), so it’s not ideal for small bathrooms with limited counter space. We also found that we got the best results with this machine when we rinsed it out after every use. Leaving the concentrate in the machine affected its ability to dispense on demand. However, rinsing it with warm water will keep it in good working condition. This isn’t an inexpensive machine, but if you have the counter space and the budget, it’s a good option for both home and professional use. The Wahl Professional has a lot to offer professional barbers and home users alike. 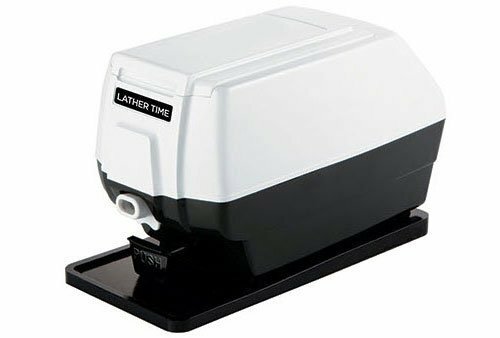 It’s a professional-quality lather dispenser at a reasonably affordable price. Heats lather so it’s hot – but not too hot. Holds a 12-ounce dispenser bottle that removes for easy cleaning. Blue indicator light tells you when it is ready. The sleek appearance will look great on your countertop. Of course, there are a couple of potential issues with this machine. The first is its size. It stands nine inches tall and takes up quite a bit of space. If you have a small bathroom or limited counter space, you may want to choose a smaller model. The second issue is how long it takes to heat up in order to use it. This machine takes the longest time of any we’ve reviewed – 50 minutes. However, it delivers great results and may be worth it if you want an attractive and reliable machine to heat your lather. 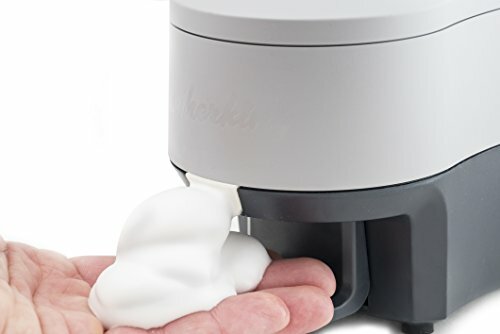 Which Shaving Cream Dispenser Features Should You Consider? Most models on the market have a variety of features. Most are a matter of personal preference, but some are practical as well. Here are some of the most important features to consider before you buy a warmer of your own. The first consideration is what type of cream it uses. Some are designed to fit on top of standard shaving cream cans. In other words, you can continue to use your favorite cream with the warmer. Other shaving gel warmers are designed to worth with a liquid shave cream concentrate. That means if you opt for one of them, you’ll need to buy the concentrate too. In some cases, the concentrates are more expensive than traditional shaving cream. Many of them are designed for use in barber shops like vbarbershop.com use shave cream concentrate. You may prefer a model that allows you to continue to use the cream you have on hand. Some men like their shaving gel to be quite hot when they apply it, while others prefer a less extreme temperature. If you want control you should look for a shaving cream warmer that has a temperature control. Even among warmers with temperature controls, there is variation. For example, some warmers have low, medium, and high settings. They allow some control, but you’re still counting on the manufacturer’s idea of what is considered hot. Other, more expensive machines, offer precise temperature control where you can choose the temperature in degrees. If you want that level of control, be prepared to pay more money for it. The next thing to think about is the size and space you have to store it. As you might expect, the versions that are primarily designed for use in barber shops are larger than those designed for home use. Ideally, you’ll want to be able to keep it someplace close to where you normally shave. For many men, that’s the bathroom counter. So, if you have a very small bathroom with limited counter space, you may want to stick to the smaller warmers on the market. The final consideration is, of course, price. We can’t tell you how much to spend, but if you have an unlimited budget, then you may want to splurge on a professional model. Most men can stick with home models and be satisfied. Their affordable prices and manageable sizes make them very popular. We’ve reviewed some of each, so you can make the best decision for your circumstances and budget. Electric shaving cream warmers have more uses than you might imagine. For example, I shave with an old-fashioned safety razor, which I love. The lather from them works perfectly with safety razors. Of course, you can also use it if you prefer shaving with a straight razor. No matter what you shave with, you want to prep your face properly to give yourself the best chance of a perfect shave. What if you shave your head? Is It Ok To Use Them? Absolutely it can! It’s just as important to open the pores on your scalp before shaving as it is to open the ones on your face. If you want a clean, professional shave, the best way to do it is to use a shaving cream warmer to deliver hot lather. Even the toughest beard or stubble can be tamed, which raises the bristles and opens your pores. We recommend reviewing the specifications of any product you’re considering, and then choosing the one that’s best suited to your personal needs, including your budget and the amount of space you had. If you do that, you’ll be share to choose the right product – and get the clean shave you deserve!